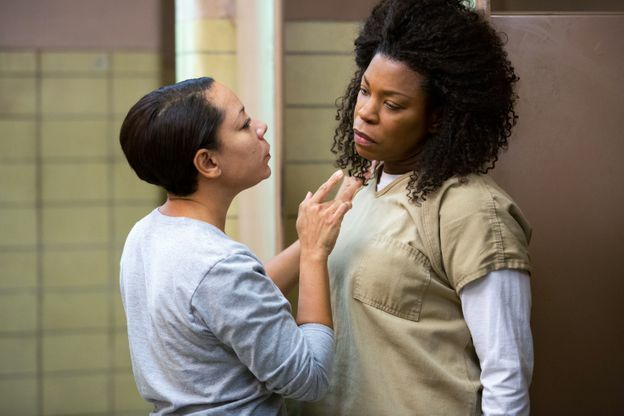 Vee, new to OITNB this season, makes trouble pretty much everywhere she goes. De Angelis and Bigger both used the word "lioness" to describe the character — and she’s in direct competition with that other lioness, Red. De Angelis notes that to get the "mane" effect, she picks out Toussaint's hair layer by layer. "Vee has to look fierce," she said. Bigger's team apparently had the most fun creating the nail art in Vee's various flashback scenes. They're all adhesive nails, though, because the beauty team needs to be able to flip back and forth between the past and present very quickly — nothing can be too permanent.